It may not be an exaggeration to say that the whole lot of small scale industries, traders and exporters are anxiously awaiting the revamped GST which is likely to emerge from the meeting of the GST Council today, 6 October 2017 which might prove a red-letter day for the industries and exporters. The GST Council, according to officials, will address the grievances of small-scale industries, traders and exporters. The package of measures expected to be taken up by the apex decision-making body may include an increase in the threshold limit for the composition scheme, a more liberal exemption limit, and a lower compliance burden with quarterly rather than monthly filing apart from steps to boost exports. The council meeting on Friday could consider raising the threshold for the composition scheme to Rs 1-1.5 crore from Rs 75 lakh to aid micro, small and medium enterprises (MSME). Under the composition scheme, an entity pays a fixed, nominal rate to avoid GST-related paperwork. While industry is pushing for raising the threshold to Rs 1.5 crore, the council will take into account concerns of the finance ministry and some states about revenue losses. Small businesses such as traders, manufacturers and restaurants can pay tax at 1%, 2% and 5%, respectively. Businesses with a turnover of up to Rs 20 lakh are exempted from payment of tax. Higher thresholds will ease the compliance burden and also reduce the filing load on the system. Prior to the rollout of the GST, excise duty on turnover of up to Rs 1.5 crore had been exempted. The council could extend the quarterly filing facility to small businesses with a turnover of up to Rs 1.5 crore. Besides, an �e-wallet� facility for exporters that will allow them to get tax credit immediately on self-declaration post exports could be taken up. �Industry has represented to us� Steps are under consideration,� said a government official, adding that the final call on the measures would be taken by the council. Kerala finance minister Thomas Isaac said GST compliance requirements were hurting the MSME sector and there was a case for raising the composition threshold to what was earlier the exemption limit. �Small-scale industry sector is facing huge compliance issues� Composition threshold should be raised to earlier excise exemption limit level,� Isaac told ET. Among the other steps that could be taken up are including only taxable items in the Rs 20 lakh exemption limit. There is now no differentiation between exempted goods and non-exempted goods while calculating this. Filing of returns could also be further simplified as part of the revamp of overall compliance to make it easier to do business, a key aim of the government. �The composition scheme needs to be strengthened to bring relief to the small taxpayers by not only increasing the threshold limit of eligibility but also by removing the irritants of payments on reverse charge and inter-state supplies,� said Bipin Sapra, partner, EY. The scheme needs to be made more accessible to other non-restaurant service providers and those that have inter-state business. 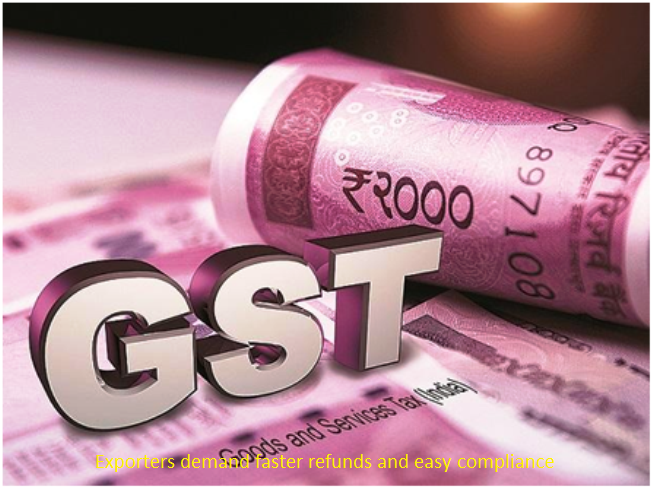 �Along with increase in threshold, the GST council should also broaden the eligibility criteria by allowing service providers (with possibly a slightly higher rate) and interstate transactions,� said Pratik Jain, leader, indirect taxes, PwC. The council will consider steps to give relief to exporters with thousands of crores in tax refunds stuck in the system and facing acute working capital shortages. The government has already allowed exporters intending to export goods or services without payment of integrated GST with a letter of undertaking barring those persons who have been prosecuted under GST or any other law in force, where the amount of tax evaded exceeds Rs 2.5 crore. A mechanism for swifter refunds as also the release of past ones will be taken up, said an official.